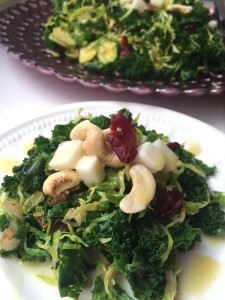 Tuesday: I Feel Good Salad which was packed with superfoods kale and Brussels sprouts and served warm. 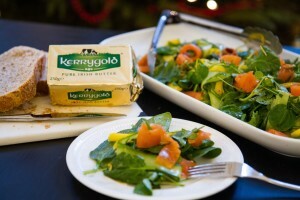 Wednesday: Smoked Salmon and Mango Salad recipe from Catherine Fulvio was so flavorful and healthy with watercress too! Thursday: Musical Fruit Salad packed with watermelon (and even served in one), corn and black beans (aka our musical part of the salad) but oh so tasty! Friday: ABC Salad which is as easy as 123! Free from everything, meaning no dairy, no sugar, no wheat, no meat, no onions or garlic. But one thing it isn’t free from is taste. It is beyond satisfying with the Avocado, Beets and Citrus. 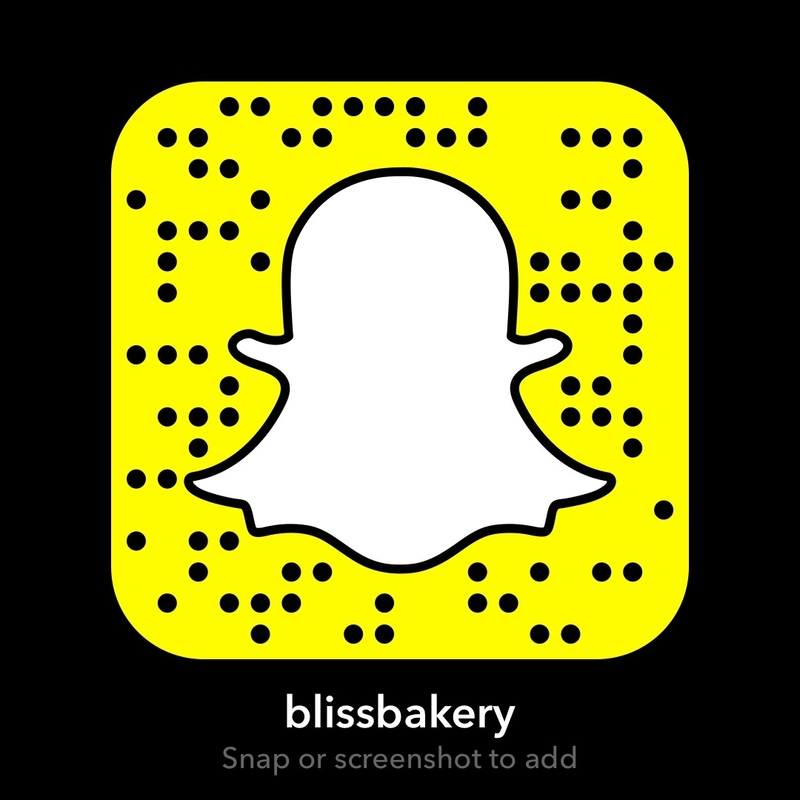 On Monday though I had four salads on offer for the snapchat tutorial (username: blissbakery), I only posted the one Irish strawberry salad recipe. 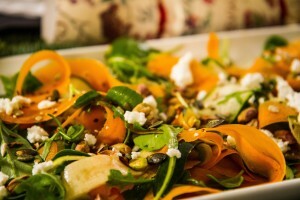 So I wanted to give you the recipe for the amazing Courgette and Carrot Salad. It is super easy to make and looks beautiful on a platter at a buffet, or in a bowl on the table. Or quite simply on your plate for lunch or dinner! It can be jazzed up with some cheese of your choice and some seeds or nuts, as I have done in this picture. The key is having either a mandoline (on my wish list for one day) or else you can use what I do which is a veg/potato peeler that is flat. My son gave me the one I have and it is quite old, but they look like this one here. Prepare the dressing by placing the last five ingredients in a screw top jar and shaking well to combine . Place the courgettes and carrots in a large salad bowl. Drizzle with the dressing and serve. You may wish to add chopped nuts such as cashews for a bit of crunch or even a bit of crumbled cheese (such as feta) as well. 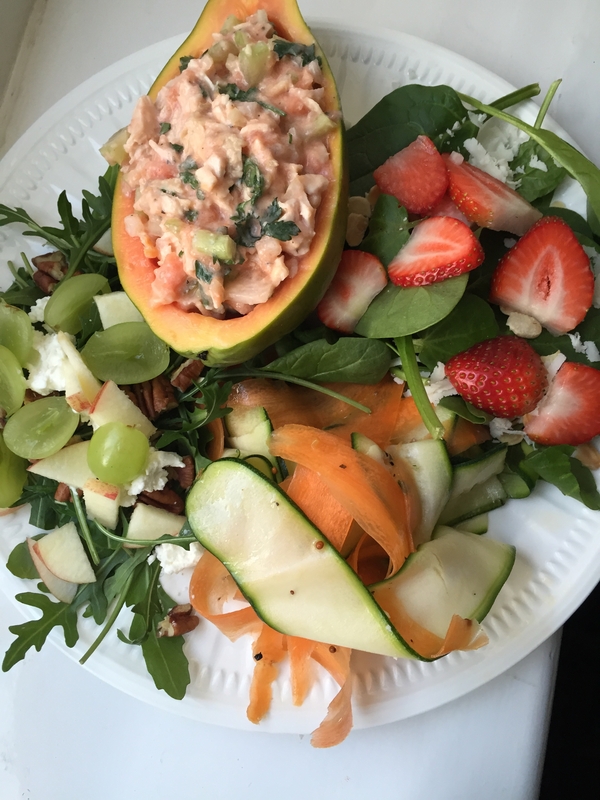 It was great to receive messages from the other snap chatters saying they were inspired with the salads this week and actually sent pics of their re-creations. It does help to feel that “we’re in it together” and have the support to do so. It can be overwhelming, especially this time of year, with all the eating plans, workout routines, and detoxes. However, just a basic but important change of adding more salads into the week can help. In fact, Hubby even thanked me Friday night for a week of salads. He admitted he felt lighter and more energetic as a result. As I said before he isn’t really into salads normally. But with a few bits and bobs added like seeds, nuts, cheese and a protein for instance, and he will even go for seconds! I had a lovely cookery student who once told me she never really ate salads until she attended my classes. 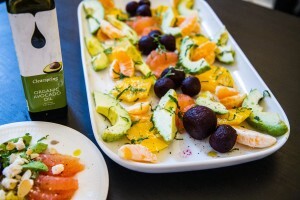 After tasting some of mine, she too began to play around with all the fun ways you can create a myriad of salads with just a little invention. If I could sum up Salad Scentral week in one word it would be color (or colour if you are on this side of the world). Looking back at all the pictures, not only of my own creations, but the ones at Ottolenghi and the beautiful salad made from Catherine Fulvio’s Woman Crush Wednesday, they all capture the eye. Like a rainbow on a plate! And the saying goes that you eat with your eyes first. So many times I have seen a salad with iceberg lettuce, a tomato or two and some white creamy processed dressing from a bottle. Not very exciting, or healthy for that matter. I only just discovered this link here that elaborates on the important health advantages of eating different colors, and what each color in our various fruits and veg can do to help our bodies work better. So I hope you too are inspired to try out some salads. Mix and match flavors and textures. Add some fruit, along with the veg and maybe some beans or lentils. 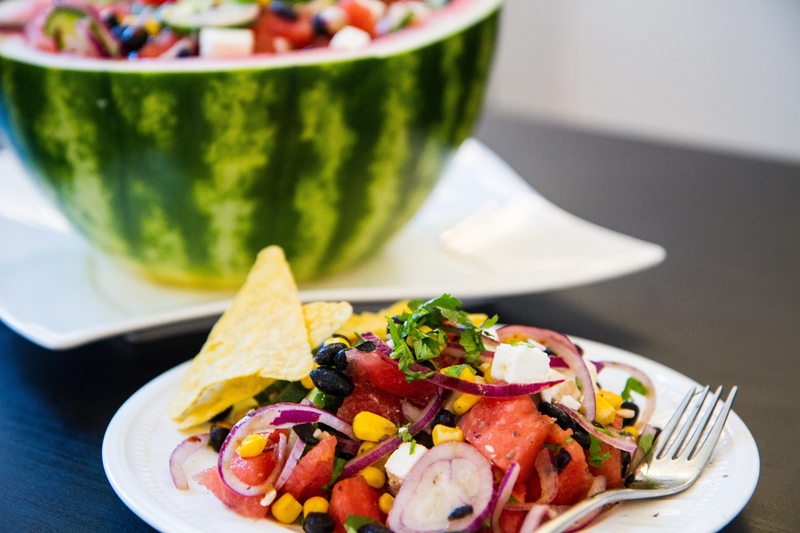 Try serving your salad in a hollowed out melon, or papaya (as I did on Monday with the turkey salad). In the winter months heat your bodies on the insides with a warm salad. 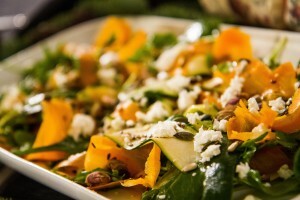 Enjoy making, serving and indeed eating salads and you too will reap many health benefits from them. My mentor Darina Allen has a mixed leaf salad with every dinner. She eats it after her main meal, as they do in France, as it is believed to aid digestion. Darina is gorgeous, energetic and youthful even at sixty-seven years young. That right there confirmed my belief in the power of some good, real, clean and tasty food such as salads! P.S. Though many people only know me for my baking and sweet treats (yes that’s me I love my goodies) I adore salads of any description. I guess I don’t feel as guilty with the odd splurge when I’ve been good having my healthy doses of salads! So don’t fear, even if you jump on the Salad Scentral Express, with the odd treat every now and again, you too will have the stamina to stay the course!